Every year, the town of San Cristobal holds a huge festival to soften the heart of the Weeping Woman – a bitter spirit who kidnapped children long ago. For many years, the children of San Cristobal slept peacefully. However, three years ago, a child went missing during the festival for real, with another child vanishing each year since! Now another child has been taken – right before your eyes! Has the Weeping Woman truly returned to take revenge? Find out in this thrilling mystery adventure! 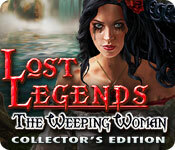 Lost Legends: The Weeping Woman Collector's Edition is rated 4.0 out of 5 by 66. Rated 5 out of 5 by coolgirl17 from it was good so the story is about the weeping woman and kids going missing but things are not what it seems to be because there two stories of her and you have to find out the truth to it and the kids and who and why they were taken anyway i finish the whole game i really like it i wish they could make more like this game .so i love the visual but i did not like was just the wallpaper was not much as i thought, that's all also it is worth buying!!!!. Rated 5 out of 5 by lottalootlani from lost legends: the weeping widow Just finished the demo!! and i am definately going to purchase the minute i complete this review, it was very colorful and intriguing and mysterious, and now i have to buy to find out what happened at the end, it was put together well...........I bet it has a great twist at the conclusion and the bonus part!! !.......totally cool game,can't wait for the download to finish! !...........HAPPY GAMING Y'ALL!! Rated 5 out of 5 by Tiger2010 from Poor Maria goes to desperate lengths! REVIEW OF MAIN GAME AND BONUS For someone like me who loves to learn about different countries' folklore, myths and legends it was a real pleasure to learn (albeit with some artistic licence by the devs) about the legends of La Llorona in the main game and El Sombreron in the bonus. The colours are bright and vibrant throughout, voiceovers are plenty with lip synch and very realistically done. The Mexican accents are quite well done also without being over the top. The 16 achievements are mostly performance related and not too difficult to achieve. As collectibles you have 25 golden skulls that are hidden behind walls and other items and 25 morphing flowers which are quite easy to find. You can also collect all notes, letters and lore items throughout for another achievement. There is a very nice teleport map, though this is no longer available in the bonus game. All collectibles end with the main game. The Weeping Woman story ends satisfactorily and completely. The bonus story of El Sombreron stands on its own and has totally different characters to the main game. This is not a very long game. I found only 15 HOS in the main game and 5 in the bonus. I counted 21 Puzzles in the main game and 6 in the bonus. All in, the whole experience lasted only just over 4 hours for me and I did not skip anything. Puzzles and HOS were mainly easy, with a few puzzles that took a bit of thinking. For a CE it's perhaps a little short, but it's a lot of fun with interesting stories and great animation. I had a great time with this game and recommend it highly. Rated 5 out of 5 by OldLady50 from Are You Tired of Pink and Purple Fairies? Good ghost story, excellent graphics (no portals to Fairyland, hooray! ), and the basic story line is based in reality (kind of) Thank you Gunnar Games, for not adding to my sugar intolerance! Rated 5 out of 5 by haiqal01 from Nothing new but entertained me. This game created by Gunnar Games - Small Town Terror series and Hidden Mysteries series. Storyline ; Spoiler Alert ! This game start with a couple Maria married with Domingo , The womanizer. After that They had 2 children and Domingo find another girl , he take all his children and left Maria . After that Maria suicide at San Cristobal Lake. Couple of years later , children when missing when Flores De Los Muertos festival was held and they said it's The Weeping Women Curse. Now it's your duty to find children and discover the truth about The Weeping Women in San Cristobal , Mexico. Gameplay : There are 4 game modes - casual , experts , advance and customs. The game has only one type of HOS and they are entertaining because it has puzzle in it and interactions. The puzzles are nothing new but they just blend together with the story and situation. Plus , There are easy. There are your journal , Interactive map , inventory locks , hint and guide button [ 6 chapters + bonus + collectibles ] There are several characters to meet but the lip syncing is not smoothly done and full voice over with Mexico accent [ I like it ]. There are 25 morphing flowers and 25 Hidden Golden Skull to find in the main games only just to get Achievements. The Achievements based on performance and story [ 17 approximately]. Option Menu : you can always adjust music , environment , sound fx , and VO volumes.you can also change difficulty , fullscreens and custom cursor. Bonus Contents : The games include SG , Wallpapers , Concept Arts , Achievements , Collectibles , and Bonus Gameplay. Overall the game is super short for me end in 2 hours and a half because of its puzzles and HOS . The Story is very interesting to follow and I really like Mexican Theme . From The game title , I thought this is a supernatural game and yes it is but only few of them. I recommended this game to all Beginners . P/S : Try the game first and then you'll know. Rated 5 out of 5 by Blackie110 from Just Beautiful I bought this game after playing demo for 10 minutes. I was taken away by all the beautiful colors. A nice change from all the dark and dreary games that are the norm here. This is a good one. Rated 5 out of 5 by DiDi212 from Bought It, Played It, Loved It! Based on completion of the CE in Casual mode. I bought this game first thing this morning and finished it this afternoon. I really enjoyed playing this game. You're a newspaper reporter sent to San Cristobal to look into the disappearance of several children who have disappeared over the past 3 years and always the night before a huge festival which is held to soften the heart of the Weeping Women -- a bitter spirit. Just as you arrive at a hotel, you see the owners daughter get snatched by the spirit -- or is it? This game has it all. Four modes of game play, the 4th being custom with no time charge for the hint or skip button; collectibles; and morphing objects. I didn't find all the collectibles or morphing objects, but the ones I did find were very easy. There are good voice overs and the music isn't bad. The HOS are all lists and are very easy. I didn't use the hint once. The puzzles are nothing new and very easy. I didn't skip any. The hint button works outside the HOS by pointing into the direction you need to go all the way to the object! There is a map which shows where there is something to do and transports you to the scene. There is a bonus chapter that has nothing to do with the main story. I really enjoyed this game and think any one from a beginner to an expert would also like it. It may not be suitable for young people. Play the demo and read some reviews to make up your on mind. Rated 5 out of 5 by skborneman from Weeping Loved this game, enjoyed the storyline, the visuals were gorgeous and I do enjoy being a dectective !! Challenges were not hard at all but still made a nice play and HO's were plentiful, all in all I purchased this game and will play over and over again. Rated 5 out of 5 by einiespal from Great game This is a well produced game with very fitting artwork and good VOs. The story is interesting and is well told. Game play is the usual. The HOS are IA with some puzzles in them, and the regular puzzles are good. There are hidden collectibles as well as morphing objects. One thing I really liked was the customizable difficulty level. One can choose to be led directly to the needed action or to be just pointed in the right direction. Or, no hints at all. The informative map, again an option, is a jump map. And most importantly, there aren't any cute critters to help you and it isn't a fairy tale! This is a very enjoyable game - good story, good setting, good game play and innovative difficulty settings. Rated 5 out of 5 by Granny_Gruff from Jackpot! OK, I can see the eye rolling even as I type! How can I be so enthusiastic over another "save the child" story? Because it is and it isn't - or is it? True to CE tradition, there are collectibles, both hidden and morphing, along with the usual expected bling. There is music, color, interactive HOS's, fair mini-games, and good animation and VOs. But it's all about the story here. You arrive to report breaking news on a local festival with a tragic twist. The festival was started to appease a spirit that snatched children in revenge for a past injustice. For years the spirit appeared to be at peace, but now has returned with a vengeance. As you have witnessed the latest kidnapping, you are more than a disinterested observer. Are you being followed? Is it a spirit or an all too real villain? Please try this one for yourself. I can guarantee no cute animal helpers and a really good story! Rated 5 out of 5 by jmcbeauty from Flores de Muerta As a journalist you are seeking the story behind the Weeping Woman. On your first night there, the daughter of the innkeeper where you are stolen is taken by the ghost of the Weeping Woman. The festival that is taking place is suppose to appease the ghost, but it isn't doing the job as children are disappearing once again. It is your job to find out what has happened to the children and to help them. There is so much to do and so much to see. There are hidden golden skulls to find, morphing flowers for the flower garden and achievements that include specific goals in the game. There are four levels of difficulty and I played the demo on casual. The fourth level is the custom level so you can decide how you want to play. The colors are bright and festive and the art is well done. The music can get a little annoying, but overall fits with the game. The hos are not difficult and interactive with micro games to open a number of the hidden items in the hos. The mini games are not difficult and are varied i.e. lining up cards by color and content. The map is also interactive and can transfer you to the place you want to go. In your notebook, as you complete the goals they have set up, they are marked off so you can go back and see what still needs to be done. All in all, a great game and definitely a keeper. Rated 5 out of 5 by biscuitsmama from A Vibrant, Colorful Game In Lost Legends: The Weeping Woman we have a tale of loss and revenge. The legend tells the story of Maria who, after the heartbreaking loss of her children, takes her own life in the river near her village, and now her spirit claims the lives of young children who are careless enough to wander too close to her watery grave. In order to placate the Weeping Woman’s spirit, the villagers have created a special day to commemorate her death, Flores de los Muertos, and for many years all was well but now the disappearances have started again. As a reporter you are here to investigate the disappearances as well as to delve into the legend of The Weeping Woman. The graphics are excellent and crisp with wonderful use of vibrant color. The artists have created characters that are very realistic and with the addition of the lip-synced voiceovers they come to life on the screen. The rest of the sound package is exactly what I like in a game with music and ambient effects that create just the right touch of excitement and mystery. It is so refreshing to have a game with vibrant, bright color in comparison to recent games that have been all pink and purple – please devs give us more games like this! There is a diary that contains your objectives as well as your notes to help you as you travel through your adventure. The interactive transporter map indicates where you have tasks to accomplish. There are various types of interactive HOPs, some are the standard list type and others are silhouette type. The puzzles in the game are nothing new but I still find them entertaining. Even though we see many of these puzzles in our HOPA games, each dev puts their own spin on these familiar puzzles so it still makes them fun and sometimes even challenging to complete. In the CE version of the game there are collectible golden skulls to find, and you will need to keep your eyes open because some of them are extremely well hidden. The game also has morphing flowers so be on the lookout for these as well. The rest of the CE extras are standard fare. Since I was fortunate enough to play the beta for The Weeping Woman, I have anxiously been waiting for its release so it was an instant buy for me but as always, I recommend that you at least try the demo to see if this is a game you will like. Rated 5 out of 5 by Tufty57 from Now, that's more like it! Based on 62/90 minutes of completed demo I do enjoy this type of game and have been somewhat dismayed recently by the lack of challenge and same old themes. Before you yell at me, yes it is the 'disappearing children' genre but is set in a real place, not some fantasy otherworld. There's not a portal in sight, not a whiff of black smoke and no cutesy animals! And, the journalist you play has a very neutral voice, so I can't tell whether it is male or female. As ever, I will not spoil the story for you, suffice to say, you have to solve the mystery and all is not what it immediately seems. Lots of CE bling including morphing flowers and hidden skulls. Puzzles could be more challenging and HOS more interactive, but they are all well done and colourful. I didn't really notice the music, so it couldn't have been too intrusive. All in all, I enjoyed the demo with no tech issues at all and will be taking advantage of the lovely weekend sale. Rated 5 out of 5 by Jeriann64 from Lost legends are found! I LOVE this game! I didn't find anything about it that I didn't like. The graphics are gorgeous, it's very colorful, the music was nice, & it wasn't confusing. I did find something I didn't like, it wasn't long enough. I would most definitely recommend this game. I will definitely buy it. Rated 4 out of 5 by coffeyfan77 from Short But Detailed Mystery This charming and exciting little hidden object game reminded me of a Scooby-Doo mystery, where you meet a few principal characters and pretty much know who did what with a few twists along the way. I liked that the game layered on a "local legend" scenario to make things more interesting, and it progresses logically as you investigate a small town and its residents to find out where their children are disappearing to. By the time everything works out, it's a surprisingly intelligent storyline, which is lacking in many other games. Graphics and sound are good but relatively unobtrusive, and the voice acting I found better than average. 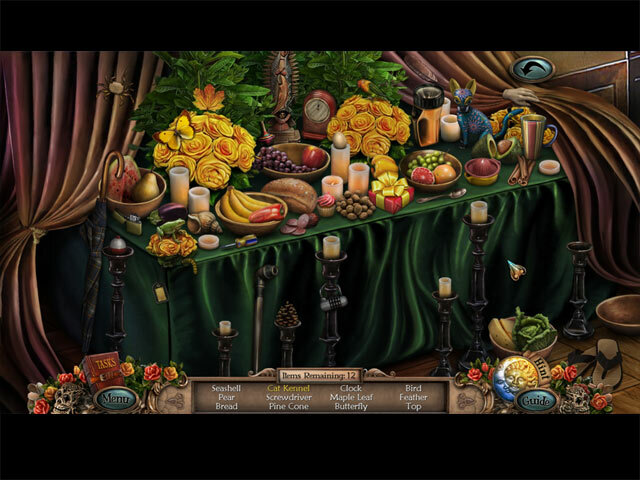 Hidden object scenes are plentiful and generally easy, with objects clearly standing out against the background. There are some minor manipulations needed to find them, like opening cabinets and such, but you'll likely have very little trouble. Puzzles are variations on ones we've seen before, but the level of challenge is up and down. Some are done almost immediately, others can take a bit longer. I personally didn't need to skip any, which is a good thing. Bonus content includes collecting morphing flowers and golden skulls. The skulls are hidden in various scenes so you'll have to pixel hunt. You also get a bonus chapter, which is a related but separate story that I also quite liked. Good work on this game which is a very enjoyable way to spend an evening or an afternoon. 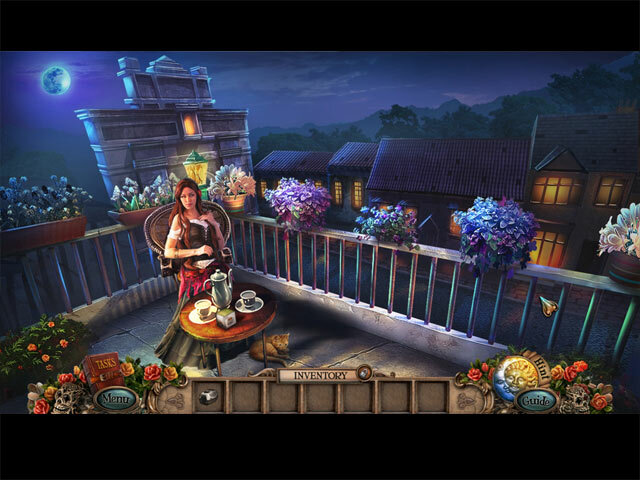 Rated 4 out of 5 by GypsyBeLoved from Solve the mystery in San Cristobal, Mexico! For many years, the children of San Cristobal slept peacefully. However, three years ago, a child went missing during the festival for real, with another child vanishing each year since! Now another child has been taken – right before your eyes! Has the Weeping Woman truly returned to take revenge? Another fun case for the detective (you) to solve! The story line is a lot of fun. The visuals are wonderful as is the sound quality. I truly enjoy long playing games and this is one of them. The HOS and Mini-games are great, getting around with the map is helpful, as well as the bonus game. I give this game a 9/10. Great game. Highly recommend it! Rated 4 out of 5 by Cherubabies from Very Colorful! Children with accents? Really? Apart from that it had lovely brilliant bright colors. The Graphics were OK. The Story line wasn't too bad either. Surprise endings were Good. Something to play on a Rainy day! I would NEVER pay full price for this, but wait until you get two for one Sales deals. Rated 4 out of 5 by catvoncruce from A very nice game! I recommend this game because I really enjoyed it, The plot is interesting as well as the graphics of the game. Rated 4 out of 5 by tutortime from Colorful Game. Really enjoyed playing this game. The scenes were interesting, pretty and colorful. The HO games were very easy and that was ok with me. The story line and bonus chapter were interesting and the game played quickly. I bought this CC game on sale so I feel it was a fair price. While the game was not fantastic, it was a solid game and fun to play. Rated 4 out of 5 by alsteele28 from Parade of the Dead Mexican style This game has a heavy Mexican 'parade of the dead' feel to it. If you are not 'offended' by this type of thing then this is a good game, with a strong storyline. As is standard with there was a VO which was the standard affair in that there was not much synching but in this instance it didn't really matter as the storyline was strong. The graphics were very much in keeping with the theme and seemed to evoke a bygone era (though couldn't quite place when the era was, possibly the 1930's but I could be way out with that one. The mini-games, were varied and strong and some nice twists on old and a smattering of new (for me anyway). There were collectables and the usual 'morph' finds to be had, I am not usually bothered about these as I usually find all but one and can't be bothered to go back all through the game to find one object, that may get me an extra wallpaper, or part of a bonus chapter. The theme is probably best for older players. perhaps 14 upwards (IMHO) as the festival is for the 'dead' and the themes of skulls etc probably is unsuitable for younger players. With the storyline being so realistic as well and not 'fantasy death' like some of the games on BF then this is also another reason why I would suggest the above age range. I highly recommend this game, especially if you can get it on offer, I would normally recommend the SE as I don't normally as I say care for the extras, but as this is on offer today, thus bringing the price right down, I would 'stretch' to buy it straight away. The free trial was once again 90 minutes, usually I can complete the trial version in this time, but in this case I couldn't thus I think this must be a longish game and probably well worth the money. If the themes of the game do not upset you and you lik a strong 'fairly realistic' storyline then I would highly recommend purchasing, certainly trialing the game, as this is one of the better games of recent times. Highly recommended due to storyline, visuals and quality of mini games and HO scenes. Rated 4 out of 5 by Mrs_Kim from Promising game A game by Gunnar Games --------------------------------- There are 4 levels of difficulties. The story is not difficult to understand. I love Latin American setting and this is one of the best Latin American setting game out there. The graphic is pretty nice, lots of colors. The HO and mini games are pretty easy, which I like. The map is quite useful, it tells you which place needs action, but there are some areas not mentioned in the map, so it can be rather confusing. The VO is okay, but at times it looks.. fake and forced. I don't think the bonus content is worth the extra price. There's basically nothing special there. You can try the demo to see what is available. I think I will wait until the SE comes out, as the main game is all that matters. Rated 4 out of 5 by catbag8717 from GAME OF THE YEAR... for 2012. BASED ON DEMO I have had a strong dislike for all other games by this developer, so I really wasn't expecting much from this one and was considering not playing it at all. However, it seemed to get decent reviews, so I went ahead and trialled it. I have to say, I'm glad I did! My opinion of this developer has changed quite considerably. This was an engrossing demo period, and I will be sure to pruchase the SE. This game is all about the story. The concept was brilliant and executed quite well. Not only that- it made sense! Over and over again, I've seen spirit-type games that have the most illogical things happen, but everything about this game was logical! I did not once have to question why everything was happening. The developers have nailed the technical side of things. Content wise, I loved everything about this story. It started wonderfully. I was really intrigued with the background story. It made me want to know more immediately. From there, everything went up. The first major plot twist was great, and the rest of the story followed suit. There was a really great spooky element to this story while still maintaining some form of realism. The demo ended wonderfully. It made me want to buy the game immediately. Overall, I haven't got one bad thing to say about this story. It was pretty close to perfect. Even though the story is fantastic, some parts of the gameplay were average. I'll start with the positives: I thoroughly enjoyed the HOS. They were basically the extra-step junkpile type, which we don't see enough of these days. What added to my enjoyment was that the HOS had lots of extra-step items. It wasn't just one or two, it was three, four, maybe even five. In addition to this, the HOS are mixed up every time you play them. I played one HOS and my game didn't save, so I had to play it again, and the objects were completely different! This is a great gameplay move by the developers as it makes things more interesting. Another good thing is that they appear frequently, but are spaced out. There were 5 all up in the demo, which gives me the impression that The puzzles were decent too. Anyone that knows me will know that I am not a puzzle person, so that's saying something. I enjoyed attempting them and was able to solve quite a few. I liked their uniqueness, and how one puzzle tied in with the story. However, I found they were quite simple, so expert players will probably be frustrated. There was something puzzle-related that just drove me nuts. I finished one puzzle, only to place the item I gained and go straight in to another one! Back-to-back puzzles just infuriates me and caused the fun factor of this game to decrease slightly. The developers should work on not letting this happen again. The sad thing is, when it comes to gameplay, that's basically it. The one big let down for me was that there was no additional gameplay features of any kind, be it something as simple as + objects or animal helpers, or something completely new. There are so many games with fantastic gameplay out lately that this one seems to fall down a little in comparison. The developer seriously needs to work on adding additional gameplay for their next game, because otherwise they're just going to get further and further behind. It's time to “get with it”, as they say, and make the gameplay more fun. The graphics were pretty good here. They were clear and had a fair bit of detail, but I especially enjoyed the character designs. They looked incredibly realistic, almost like real people, and were drawn well. The colours are great, a nice change from the usual bright coloured stuff we've been seeing lately. The developer's choice of colours was quite good as it was realistic and made me feel like I was in a real place. The voice-overs have Mexican accents, which fits the theme of the game well, but are otherwise just standard. I have no problem with them. FEATURES 4 modes of difficulty: Casual, Advanced, Hard and Custom. The differences are standard. I played Casual. Hint/Skip- Both charged at a decent speed for the difficulty I selected. However, I disliked the hint system. The Casual hint system included a lot of hand holding, making it extremely obvious what to do next. I like to play Casual to relax, not because I find the games hard. Developers need to work on this. Diary- The diary was good for keeping track of events. It was a nice read. Map- Regretfully, I didn't find the map very helpful at all. It was interactive, but it did not display all the unlocked locations, only a few, which really irritated me. CE EXCLUSIVES Bonus Chapter- Unsure if needed. Built-in Strategy Guide- Shows locations of collectibles. Achievements Concept Art Wallpapers Collectible golden skulls (25)- These are hidden quite well, and you have to click on a certain area in the scene to find them. Collectible morphing flowers WHICH IS THE BETTER BUY? The CE Bonus Content is incredibly weak. There's absolutely nothing in there that makes me even consider the CE. For the best value for money, I highly advise you wait for the SE. This game was very enjoyable. I haven't enjoyed a game this much for a while. Everything about this game is fantastic, except for the gameplay. Unfortunately, due to the lack of extra gameplay features, I must give a four star rating to what otherwise would have been a five star game. If I was playing this game in 2012 or early 2013, I wouldn't have hesitated to give this five stars. But in 2014, the bar has been raised, and the developer needs to acknowledge that. All that aside, this is one great game that you should thoroughly enjoy. Rated 4 out of 5 by eponym from Good Play I enjoyed the game. The visuals were appealing but the storyline was way too transparent. Like knowing the ending of a book before you get to it. That was disappointing but it was not a fatal flaw. Rated 4 out of 5 by sdrhome from Good enough story but too short!!! Everything was pretty decent with this game. My only two issues were that the story was kind of weak. Good idea but not really fleshed out. The other was that it was too short. The bonus game was a totally different story line and so it could have easily just been a regular game without the bonus. Rated 4 out of 5 by Darklldo from Not a game for seasoned players but a very good game for people who are just beginning to play Hidden Objects. It's not too hard and the hint button gives you more than just one hint, it will take you to the next item to be dealt with. The scenes are pleasant and the voices easy to listen to. Everyone's nice except for the villains and they are not that bad :) I would suggest that for seasoned players it's just a nice way to pass a relaxing wet day. Rated 4 out of 5 by ReneThePig from Trial Review - On my Buy List! What a nice change of pace! Colorful, interesting scenery. Well drawn characters and pleasant voices. The music is nice and the sound effects are cool. The puzzles were somewhat simple but also sort of interesting. While the story isn't a new one - I found myself wanting to know more and solve the mystery. I enjoyed the trial and look forward to purchasing this one. Rated 4 out of 5 by arnold1049 from GREAT NEW GAME I played the whole game plus the bonus chapter on a custom difficulty level that was only one level up from the casual mode. I used the custom mode so that I wouldn’t get sparkle hints when I was in a hidden object scene. That drives me crazy. I also did not play with sound; I never do, as the repetitiveness of the music annoys me. However, this game allowed me to hear the voiceovers even with the sound turned off. I think this is one of the best things games can make available to us players. I love listening to voiceovers and this game, set in Mexico, had excellent voiceovers. All the accents were right on. The graphics were awesome; clear and bright, even though the storyline is another dark subject; a woman who committed suicide because she lost her children to her ex-husband and his new lover, then comes back from the grave and steals children. The characters looked very life-like and the mouth movements fit the voiceovers extremely well. The game had achievements to win and morphing flowers and golden skulls to collect. I was able to find only 21 of the 25 flowers/skulls, so I’m guessing I missed them in the same 4 scenes. They might have been in the very first scenes, before the tutorial pointed them out. I missed those 2 achievements, as well as the achievement for winning all the achievements. I can live with missing only 3 out of 16 achievements. The achievements were attainable, unlike a lot of games I’ve played. There was only one achievement based on speed (finish a hidden object scene in 1 minute) and I was finally able to do this in the bonus chapter. 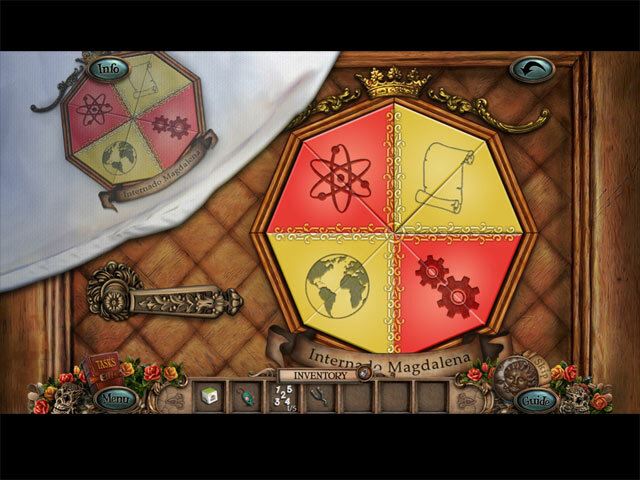 The hidden object scenes in the main game were interactive, with puzzles and other actions needed in order to find some objects, so I think it would be very hard for anyone to finish those kinds of scenes in under a minute. The hidden object scenes and puzzles were good. The hidden objects weren’t too small and the scenes weren’t dark. Some of the puzzles were difficult enough that I had to refer to the strategy guide in order to solve them. (Built-in strategy guide, another big plus for the game.) I didn’t want to miss an achievement by skipping them. The information on how to play the puzzles was also very good. The map during the main game was interactive and, in casual mode, showed where actions needed to be taken. There was no map for the bonus chapter, which resulted in a lot of back and forth, but not an excessive amount. The hint button worked as a navigational tool, so that helped. The bonus chapter was fairly long. It was not an extension of the main game, but was set in the same location, just with a different subject. I kind of expected to pick up the 4 missing flowers/skulls during the bonus play, but that did not happen; there were no flowers/skulls in the bonus chapter. I’ve always wondered why the hint button doesn’t work when you are in a puzzle. It would seem to me that just a little help to get you started on a puzzle would be a good thing, instead of an all or nothing strategy; either you solve the puzzle or you have to skip it. I think this is a great game and a great effort on BF’s part. Keep them coming.